I swear I *just* made this quilt top. Turns out *just* was last June! It’s a good thing I have past blog posts to keep a record of when I make things! I backed this one with a blue grid fabric by Lotta Jansdotter for Windham Fabrics, and bound it with my favorite gray seeds print. I quilted this with simple loopty loops and posted a short (grainy!) video on Instagram awhile back of me quilting this one with my Juki. 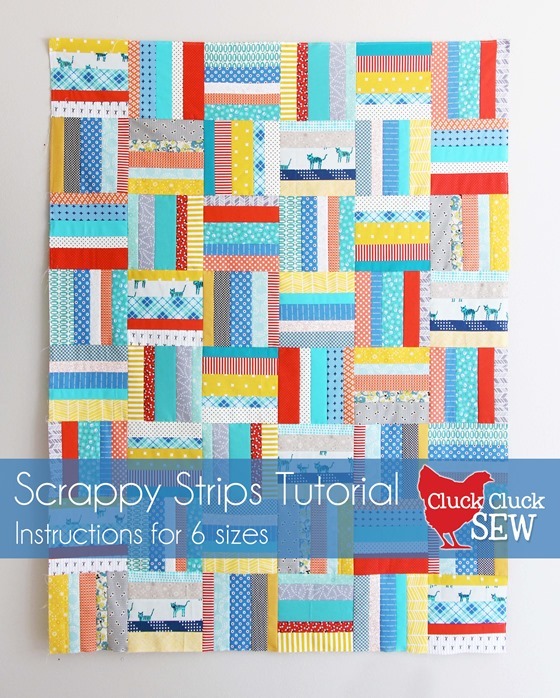 This quilt was from my Scrappy Strips Tutorial in 6 sizes, found here (or click the picture below). 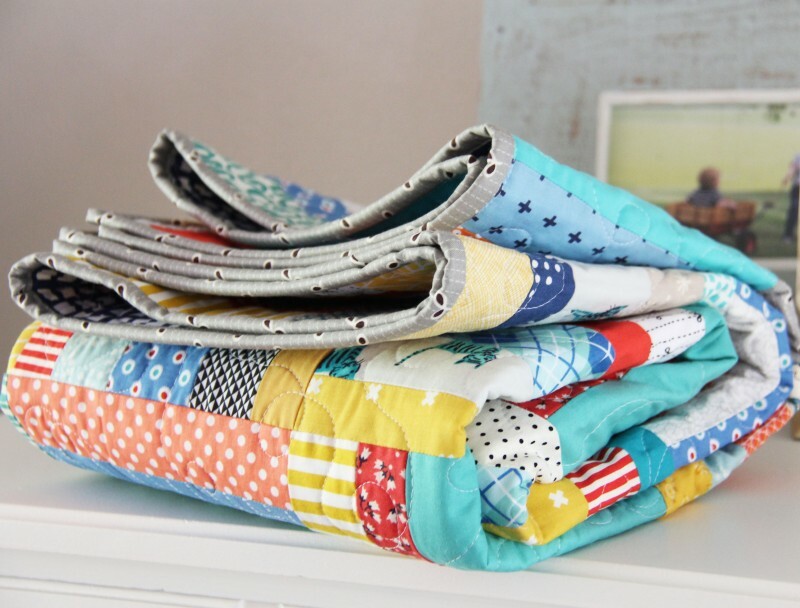 It’s a fun and fast quilt to make…especially if it doesn’t take you 11 months to finish it!! What a great way to use those scraps! This is beautiful- so happy and bright! I always love your choice of fabrics! I have followed you for so long and I still get excited to see your quilts! :) Thank you for sharing your beautiful work! 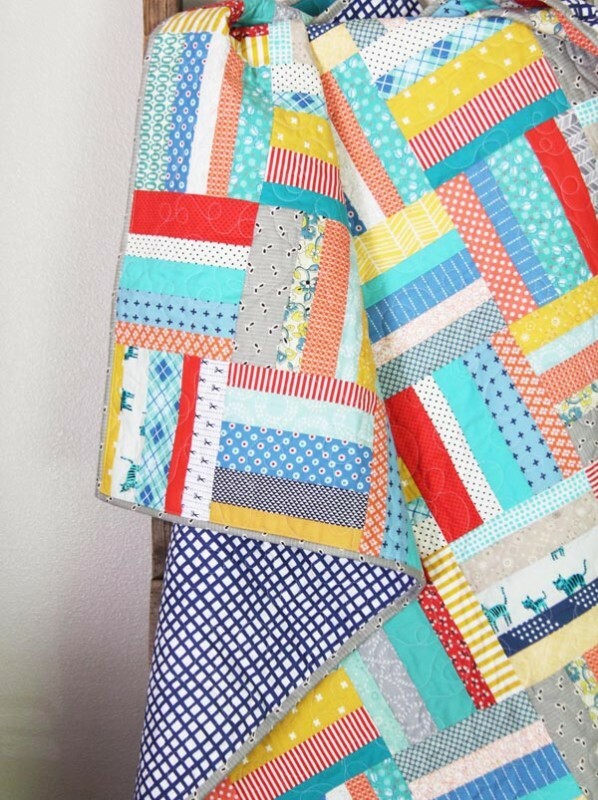 Pretty, and fun quilt. I am thinking this would be a great starter quilt for my grand daughter. On another note, there are ads that appear in-between your photos, don’t know if you are able to control/eliminate these, but I can’t get rid of them. They really mar the appearance and enjoyment of your posts. I don’t see ads between her pictures, must be your computer or your browser. Really pretty quilt. I’m always amazed at how much you get done with little ones around. This is the first time I have seen the ads, and I’ve been following the blog for months. Oh, just saw your comment Allison, I’m not reading on a mobile device. Hope you can get them to go away! I have people working on it! It’s a new plug in that I can’t figure out and it’s putting the ads in my content…will be fixed shortly! :) I think it’s just on the mobile version, which is why some don’t see it. I’ve had that happen to me too – I think I “just” made it and reality it’s been a couple years. Very pretty quilt. How beautiful! I think you did a fabulous job, I LOVE the fabric including the binding and backing. The quilting is wonderful. TFS. So very pretty! 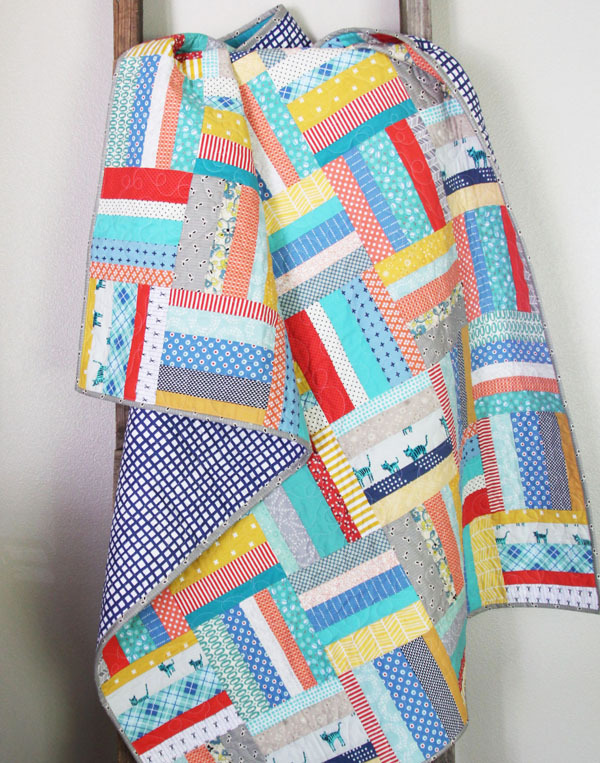 Great use of scraps,iron for those fabrics you love,but just to afraid to use because of the print. I just started using your tutorial to make this quilt (THANK YOU!) and I was curious to see how you quilted it. So this post was super timely for me! My daughter picked out the fabrics for me to make this quilt for her birthday and she is super excited…thanks again!